Guide books for Thailand are currently available in abundance. But which offers the most useful information and which Thailand travel guide suits you and is the perfect choice for your next trip? Each Travel Guide Book sets a different focus and therefore there is a wide range of topics. Some are suited better for backpacking in Thailand, others focus on Individual Travel. Some spoil their readers with beautiful pictures and others will favour more information. Lovely accommodation, delicious restaurants, best tourist attractions, excursions, itineraries, maps and information about transport in Thailand – all this and even more you will find compact in a guide. Although we did a lot of blog research for our trips to Thailand, a good Thailand travel book is always part of our trip planning. From there we get lots of inspirations and useful travel tips for Thailand, which Google might not spit out right away. This travel book provides the best information on beaches and islands of Thailand. If you want to explore the most beautiful islands of the country on your own, then this one is the travel guide you are looking for. The travel book is thoroughly researched and provides plenty of information on travel in South Thailand, accommodation and transport. Really great are the maps to the various islands. This guide is certainly one of the most popular among Thailand travellers! If you are planning to explore the spectacular islands of Thailand, sure you will be more than happy with this Lonely Planet. Conclusion: This guide is great for travel planning in advance, but also a helpful tool while island hopping in Thailand. -> Click here for more! The I Love Thailand travel book really makes you want to go on a Thailand trip! You learn all about the most beautiful sights, get plenty of insider tips and it’s a big help for your travel planning. All described activities were tried out and tested by the author. This guide is really enjoyable to read and at the same time you learn everything you need as a backpacker in Thailand. This travel guide does not overwhelm with information, but it will show you the best activities in a compact manner. Especially amazing are the insider tips! Conclusion: A wonderful travel guide, perfect for your first trip to Thailand! The Lonely Planet Thailand – some call it the backpacker bible, puts a lot of value on details. This travel book is so well researched and will lead you through the most beautiful regions of Thailand. Especially for individual travellers who would like to explore Thailand away from mass tourism, this guide is highly recommended. For each destination you will find tons of information and accommodations. Also fantastic are the overview maps and the suggestions for the different itineraries. Backpackers will also find many valuable tips on travelling on a budget in Thailand. A Thailand travel guide with a lot of content, but only a few pictures. Conclusion: With a Lonely Planet Planet in your backbag, you will be definitely be well prepared for your trip to Thailand. 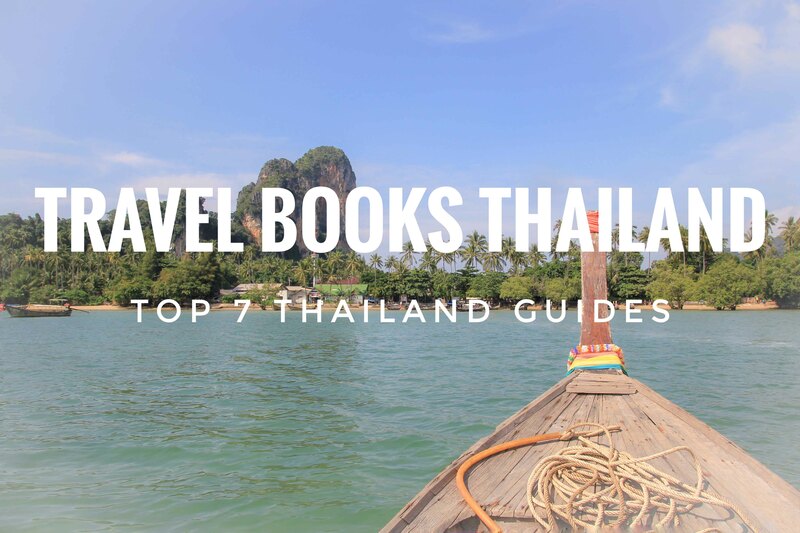 The Fodor’s travel guide is the perfect travel book to get to know all important things about traveling in Thailand quickly and provides its readers a fantastic overview. Of course, you will also find information on transport, accommodation and restaurants and also exclusive tips from locals. The best-of-lists are amazing and around 50 maps will help you organize yourself perfectly. Additionally, you will find the top highlights of Thailand, as well as neighbouring Cambodia and Laos. Conclusion: A brand new travel guide about Thailand which is super-informative! Watch out ladies: If you are traveling solo through Thailand, this amazing travel book should probably be your choice! You learn all about how to travel with a short amount of time and you will get lots of insider tips from a woman, who knows what she is talking about. Don`t expect to read lots about Thailand history and ancient facts. The focus is on exploring off-the-beaten-path places, local secrets, the best islands, awesome activities and how to stay safe while traveling solo! Conclusion: A must have travel book for ladies, which love traveling through Thailand. You are planning to stay a few days in Bangkok and you want to get the most out of your time? In that case you should get yourself the Lonely Planet Bangkok. Certainly, you will find detailed information about the city and plenty of maps. Packed with useful insider tips about how to avoid the crowds, save time and how to travel on a budget. Also, this guide book is full of info about history, religion, politics and many more. Additionally, 35 maps will help you to navigate in Bangkok. Conclusion: Our favourite choice for Bangkok! If you read this travel book, you won`t want to wait for your journey to Thailand to begin. This lovely guide shows you some of the best things to Do in Thailand. Perfect to prepare you for awesome things you can expect in Thailand. Anyway, if you are planning to travel through Thailand individually you may need a more informative guide. But in case you need some great inspirations and some good stuff to read on your flight, this travel book is an amazing choice. Conclusion: Wonderful travel guide which makes you wanna explore more!